Buick is moving the next-generation LaCrosse a few notches upmarket in looks, materials, optional equipment and price. "We are going after what I am calling unpretentious luxury-seekers. They like near-luxury, they like great things, and they are willing to pay for them," said Susan Docherty, vice president of Buick-Pontiac-GMC. "But from a personality standpoint, they like something that is a little more understated." The redesigned 2010 LaCrosse offers such upscale accoutrements as contrasting thread and French stitching on the instrument panel, power-operated rear sunshade and cool blue ambient interior lighting. The new LaCrosse is aimed at Lexus ES 350 and Toyota Avalon customers, along with owners of the Buick Enclave crossover who have an imported sedan in their garage, said Docherty. Sales of the LaCrosse begin this summer. 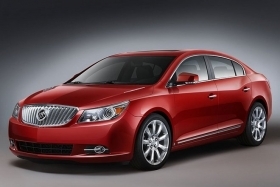 Pricing has not been announced, but Buick created space in the model line for a higher-priced LaCrosse when it increased the sticker price of the full-sized 2009 Lucerne CX to $30,030 including shipping, $1,990 over the 2008 model. The 2009 LaCrosse CX stickers for $26,390 with shipping. The 2010 LaCrosse was developed on General Motors' new global mid-sized, front-drive architecture. The development was a collaboration involving designers in the United States and China, in partnership with Pan Asia Technical Automotive Center and body and chassis engineers in Germany. The result is the first GM vehicle to be created on three continents. Engineers reduced interior noise and created ride and handling attributes comparable to those of some luxury brands, said Jim Federico, GM's vehicle line executive for the global mid-sized architecture. North American models will be offered with a choice of two V-6 engines and a six-speed automatic transmission. For the first time, the LaCrosse will be available with all-wheel drive. Up to 85 percent of the torque can be sent to the rear wheels, which gives the LaCrosse "more of a rear-wheel-drive driving experience on dry pavement," said Federico, who spoke at a LaCrosse press event last month. The new LaCrosse is a key vehicle in the Buick-Pontiac-GMC channel, said Docherty. "With the introduction of the Enclave, we have broken through the perception that Buick was just a brand for old people," she said. "The Enclave started a transformation of the brand that has only just begun."